Every now and again somebody new to camera trapping asks me for advice to help them get started. I usually help with whatever advice I can think of at the time, but it is often unstructured and incomplete. I decided to create this page on my blog to try and provide a better way of helping new camera trappers to get up to speed with the basic camera trapping concepts. The content below is based on my own experience, and might differ from person to person. The idea is not to tell you what camera to buy (only you know what your requirements and budget are), but to help you make an informed decision. In short a camera trap (also known as a "trail camera" or "remote camera") is a device that allows you to "trap" animals using a camera. Modern camera traps usually consists of a digital camera that is powered by a set of batteries. The camera will take a photograph when it is triggered by the motion sensor. Most modern cameras use a PIR heat sensor to detect motion, similar to the ones used by your home alarm system. The camera trap usually stores the photos on a SD card which can be removed and download to your computer at a later stage. Some camera trap models also include a built in photo viewer to help preview the photographs while in the field (not all models come with a viewer). The first thing you have to decide upon is whether you want to buy an already assembled "commercial" camera trap, or whether you would like to build your own "homebrew" camera trap. Commercial camera traps are much easier to get started with. You simply insert batteries and a SD card and you are ready to go. The homebrew camera traps will require you to build the case, buy a normal point-and-shoot camera, open it up and do some soldering to attach the detection circuit board. Easy to get started with. Getting started can be a little daunting and take a lot of time. Poor to medium photo quality. Good to excellent photo quality. Easier to buy and get support for. Harder to find and buy the correct parts. Harder to find support, although the community is very helpful and friendly. 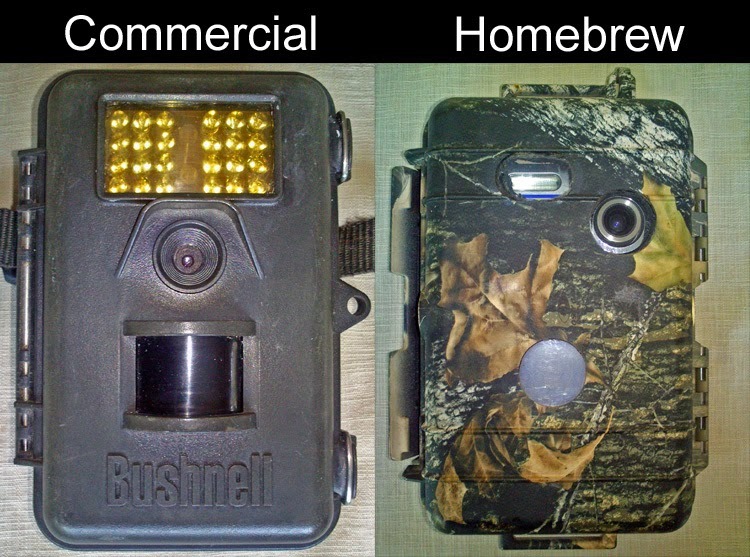 Commercial camera traps are the most popular and practical choice for people new to camera trapping. Thus the rest of this article will focus on commercial camera traps. There are two main flash types on the market: Flash Tube and LED Flash. Most of the cameras on the market these days use a LED Flash. The Flash Tube cameras will produce a visible white flash, which results in full colour photographs at night. Most LED Flash cameras will only produce light in the infrared spectrum which is invisible to most animals and will result in greyscale (black-and-white) photographs at night. Some LED Flash cameras use LEDs that produce white light, which will result in colour photographs at night. There are thus two types of LED Flash: IR (Infrared) LED and White LED. The LED lights on most IR LED cameras will glow a faint red when the flash is active. This glow is limited to the LEDs themselves and does not illuminate the surroundings. Some camera trap models will hide this glow by covering the LEDs with a red filter, or using a different kind of LED that does not produce the visible red glow as a side effect. These cameras are usually known as Black Flash or No Glow camera traps. Currently of all the commercial camera traps the IR LED models are more common and usually the cheapest. Flash range, strength and quality are all important aspects of any camera trap and have a big impact on the quality of the night time photographs. I strongly recommend looking for sample photographs from the exact same model before buying any camera trap. Uses full spectrum white light generated by a Flash Tube. Uses Infra Red light generated be an array of small LED lights. Similar to IR LED Flash cameras, but uses LED lights that generate white light. Night time photos are in colour. Night time photos are in greyscale (black-and-white). Night time photos are in colour. The flash is visible to humans and animals. The flash is invisible to humans and most animals. A very faint red glow is visible inside the LED lights. This glow is not visible on the animal or surroundings, only inside the LEDs. The some models have a filter over the LEDs to hide this glow or use different LEDs. The flash is visible to humans and animals. The flash illuminates the surroundings for a very short time. The LED lights stay on for some time (longer than a Flash Tube, a second or two). The LED light stay on for some time (longer than a Flash Tube, a second or two). Can take up to 30 seconds for the flash to re-charge before subsequent photos are possible. The LEDs do not need to recharge and are immediately available for subsequent photos. The LEDs do not need to recharge and are immediately available for subsequent photos. Photos are sharp with very little motion blur. Photos often suffer from some motion blur when the animal is moving fast. Photos often suffer from some motion blur when the animal is moving fast. The flash may generate some noise when it goes off. Usually very quiet cameras, but some make a little noise when the IR filter is moved in front of the lens. Usually very quiet cameras. Having a large flash range might sound like a good thing, but it depends on your needs. If you will be doing a lot of camera trapping in wide open spaces where the animals won't be close to the camera, then a strong flash is good. If you will be placing the camera trap on game trails or close to the animals, then a weaker (shorter) flash is more ideal. Personally I tend to place my cameras fairly close to the animals, and thus don't mind a shorter flash. The most common problem I run into is that the camera's flash will be too strong, resulting in a lot of whiteout in the photos. The flash on almost all camera traps will overexpose the animal if it comes too close to the camera. However there is a large difference in quality between brands and models, with some doing a much better job than others at producing good photographs. It is thus important to look for sample photos and reviews before purchasing a camera trap. 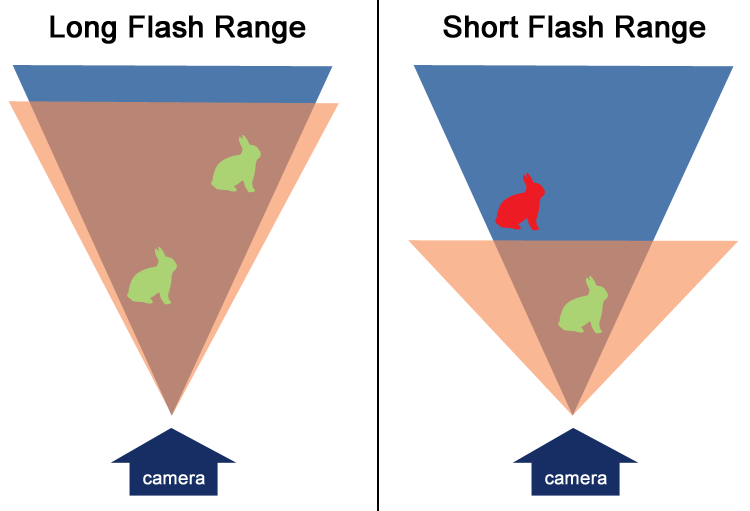 The amount of flash light produced is too much for the distance between the camera and animal. The idea is to scatter the direction of the light that leaves the flash. Light that was scattered more evenly will reflect back more naturally to the camera's sensor and produce softer and better lit images. It is often necessary to place a camera trap in close proximity to the animal. Luckily there are some tricks you can use to try and reduce the strength of the flash. Some cameras have a setting that can be used to adjust the flash range or strength. You can cover the flash with something semi-translucent or cover a large part of the flash with something non-translucent leaving only small gaps open. I've had some success using press-stick, isolation tape or layers of plastic shopping bags. You can also use textured glass to scatter the flash light and soften the image. This seems to help a lot to reduce the amount of whiteout areas in the photographs. For best results combine all the above options. If you are experiencing problems with the flash being too weak, then the best thing you can do is to place the camera trap closer to the subject. You can also try to use fresh batteries and make sure to buy a good brand. The Lithium batteries have a lot of kick and can provide more power to the flash than ordinary Alkaline batteries, possibly improving your flash strength slightly. You can also improve the time it takes a flash tube to recharge by using better batteries. Again the Lithium batteries will provide the best results. It is important to keep the detection distance in mind when buying and using your camera trap. Most camera traps have a maximum detection distance of about 15-25m. Check your camera's specification for details. You might be tempted to think that a larger detection distance is better, but that is not necessarily the case. A long detection range is only a benefit when you want to cover a large area. If you are using your camera trap in smaller spaces (less than 15m) then a long detection distance will be a hindrance, potentially causing a lot of false triggers from the vegetation in the background. The detection range is also negatively affected by extreme the weather conditions (very hot, cold or rainy). Making it difficult for the camera to detect the animal's body heat or distinguish the body heat from the surroundings. Personally I almost always place my camera traps between 2-8m from the target and thus isn't very concerned about the maximum detection distance as long as the vegetation in the background does not cause too many false triggers. 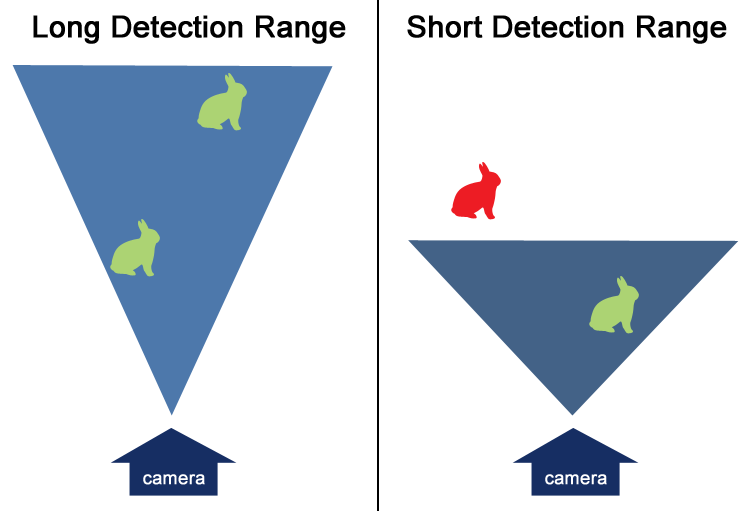 The detection width is one of the most important aspects of a camera trap. It has a huge impact on how the camera can be used. There really isn't a perfect detection width. In general wider is better, because it reduces the change that an animal will be missed. A narrow detection width might miss many animals, but the animals that are detected will be well placed in the centre of the photograph. A narrow detection width is also useful if you are camera trapping in very dense vegetation that might be prone to creating false triggers. Personally I would recommend a fairly wide detection range, because it will miss less of the action, but a narrow detection width has it's uses and can be a valuable addition to your camera trapping arsenal. Normally you don't have to worry too much about the detection height. 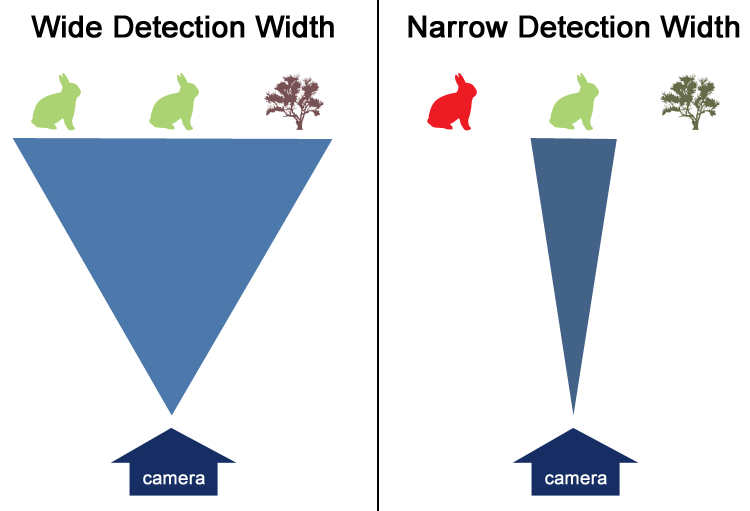 Most camera traps will detect animals that are the same height as or below the camera's sensor motion sensor. Although they differ slightly on how far below the sensor the camera will detect movement. You might want to look for a camera with a broad detection height if you plan on camera trapping many small animals (such as weasels, mongooses and mice) or animals that can be on different heights (such as birds or squirrels in a tree). Personally I would recommend a fairly broad detection height, although under normal use you will not need to worry too much about this. Cameras have different fields of view. 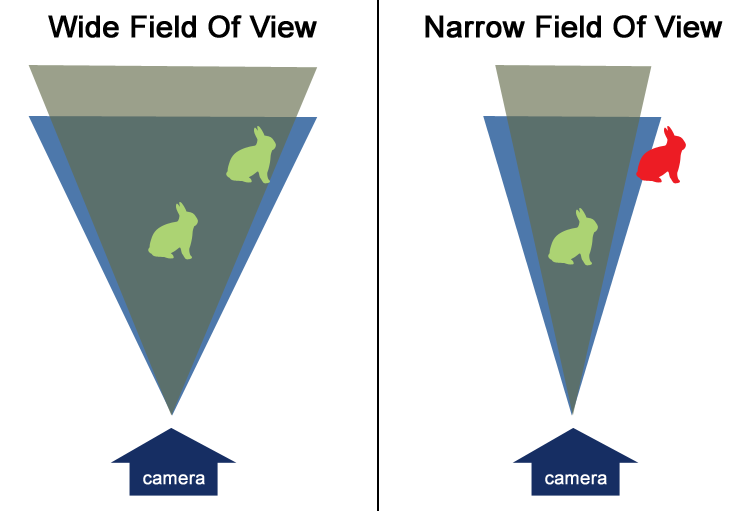 The field of view and detection zone does not always overlap. In general the wider the field of view the better, because the photos will cover a greater area. Maybe the most important property of any camera trap is its trigger speed. 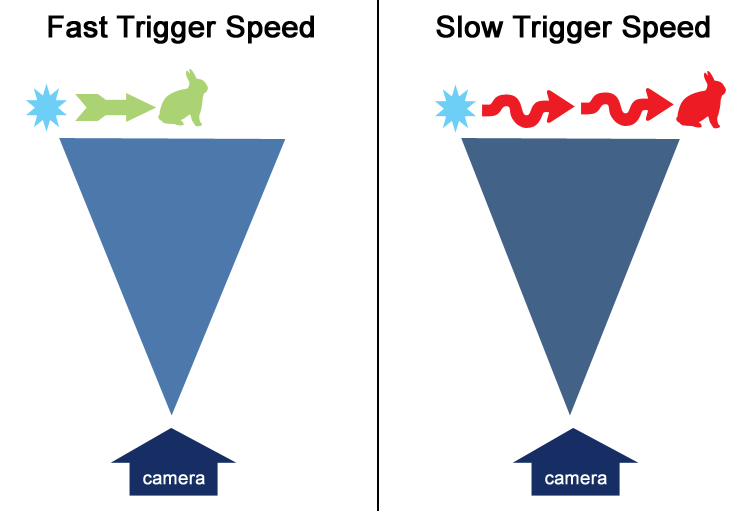 The trigger speed indicates how much time passes from the camera initially detecting the animal, to it actually taking a photograph of it. There is almost no reason you would ever want a slow trigger speed. The faster the better. Personally I would think more than twice before buying a camera trap with a trigger speed slower than 1 second. Recovery time is the time it takes the camera to reset itself and be ready to be triggered again. It is an important aspect of any camera trap and you would like the camera to be as fast as possible. At night cameras using flash tubes (most white flash models) will need about 30 seconds to recharge the flash before being able to take another photograph. The LED (IR and White models) will be able to recover much faster. 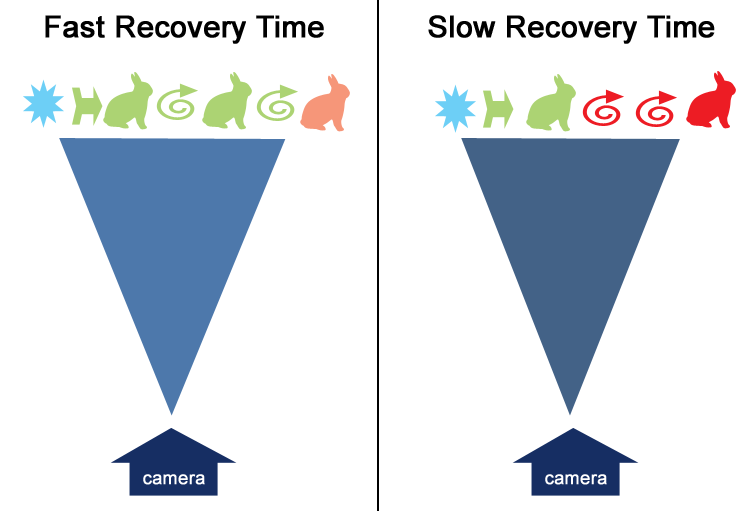 Personally I would recommend a camera with as fast a recovery time as possible. Always use the best batteries you can find and afford. In general I've had the best results with Energizer. I've stopped using Duracell after consistently getting poor performance from them. I don't even try using any cheaper brand. Never mix battery brands or types. Also never ever mix new and old batteries. These are the normal battery you find at most stores. Always use good batteries from a well known brand. They last fairly long and are reasonably cheap to replace. More expensive than Alkaline batteries. Has very good power output. Lasts very long, but are expensive to replace. These are the modern rechargeable batteries. Make sure to use high quality batteries, or you will run into strange problems because the batteries aren't producing enough power. NiMH batteries will run down faster than Alkaline and Lithium batteries, even if they aren't being used. Can be re-used, but are very expensive to replace. Personally I mostly use Alkaline batteries because they are the most cost effective. NiMH batteries are great for home use, but it can be quite expensive to buy two sets of batteries per camera (even thought the prices came down in recent years). I've lost complete sets of batteries, mostly because of very rainy or misty weather conditions. Loosing a set of Alkaline batteries is OK, but having to replace a set of Lithium or NiMH batteries can be very expensive. I probably loose at least 2-3 sets of batteries per year, making it too financially risky to use anything other than Alkaline batteries. Similar to normal digital cameras, most camera traps use SD cards for storing the photographs. Try to use well known brands, and test the SD card (especially less well known brands) with each of your camera traps. The transfer speed doesn't matter too much, but the storage size does. Most modern camera traps can take 2-32 GB cards, but older camera traps can only use cards smaller than 2 GB (or sometimes smaller than 1GB). Some camera traps also have a very small amount of built in memory that will be used if there isn't any SD card inserted into the camera. Many camera traps allow you to connect the camera to your computer to download the photographs via a USB connection (or similar). However the easiest, and recommended, way of downloading your photographs is to remove the SD card form the camera and then insert it into your computer. The SD card should be picked up by the computer in the same way as a normal USB memory stick would. Many computers have a built in slot for SD cards (most laptops have this). If your computer does not have a slot, then you can buy a SD card reader that can be plugged into the computer's USB port from most digital camera or computer shops. Personally I would recommend having two SD cards per camera trap. That way it makes it easy to swap out the card without having to take the camera out of the field. You can then download the photographs from the SD card at home. Most camera traps can take both photographs and video. Which setting to use depends on your personal needs and preferences. It is worth noting that if you are planning to camera trap very small animals, such as mice, then the video setting sometimes works better. Small animals can move around quickly and the video gives you a better chance of getting a good look at the animal. Personally I prefer to use photographs for the most part, because they are easier to view, store and maintain. Videos are great but it can take very long to review them all and it takes up a lot of storage space. I only switch to video when I want to capture specific behaviour on video, or I'm camera trapping small mammals such as mice. Camera traps are built to be weather resistant and can handle any "normal" outdoors weather. You can safely use them outdoors without worrying about the sun, wind or rain. Severe heat or cold will affect the camera traps. However, camera trap are very rarely affected by the weather. It is much more common for the batteries to start acting up first. Camera traps are good at handling heavy rain, but you can run into problems if the camera is wet for extended periods of time (days). No camera trap is completely air tight and moisture will seep in. The biggest problem is misty weather or very humid conditions. The moisture will condensate inside the camera trap's body, especially if it is in a shady or damp location. Moisture also condensates during the cold nights. Normal rain seldom causes problems. Most camera traps will recover from being affected by water. If your camera trap got wet and does not want to power on any more, simply take it home and let it dry out completely by leaving it indoors in a sunny spot for few days. Then insert fresh batteries and it should power back on. I have dried out my cameras like this many time during the cold, wet and misty winters here in Cape Town. It is also common to get blurry photographs due to condensation on the camera trap's lens. You can try to reduce this be keeping the lens clean (smooth). I have noticed that during extremely hot days that some camera traps may reset itself to the factory default settings. You will notice that this has happened when the date and time printed on the photos suddenly changes. The cameras should be fine once the day cools off and you should be able to reset the correct date and time the next time you check the camera trap. In short, don't be afraid to leave the camera trap outdoors for extended periods of time. The cameras are durable and are designed to handle normal weather conditions. In general the best way to protect your camera trap is by hiding it well. You can buy security boxes for many camera trap models, but the best way to keep it safe is to limit the number of people that can notice the camera trap while it is in the field. The security boxes might give the camera some protection, but it also makes it stand out more from the natural surroundings. In general I would recommend to avoid areas with high human activity. The less likely a human is to see the camera trap the less likely it is that somebody will try to steal or damage it. You can hide the camera trap by using the surrounding vegetation. Cutting of twigs and attaching it to the side of the camera trap helps to break the shape of the box and makes it harder to spot. Most small to medium sized animals to not pose a threat to a camera trap. Some might knock it over either on purpose or by accident. On rare occasions they might carry it off a short distance, so remember to search the surroundings if your camera trap isn't where you left it. It might not be stole but simply carried off a few meters by a curious animal. Camera trapping in areas with large animals can be more tricky, but again stealth is your best chance of keeping the cameras safe. Elephant, bear and predator proof boxes are available, but you will have to consider whether the extra cost is worth it. Keeping the camera trap clean and free of any "edible" or "interesting" scents will also help to reduce the temptation of a large animal to try and see what is inside. In short, the greatest security concern for any camera trap is from other humans. So think twice before leaving it out in the open or next to a road that is frequented by people. Lastly, it is good to remember that not all people are thieves or trespassers that want to steal or damage your camera trap. I've photographed many people walking past my cameras traps. Some never notice the camera, others don't know what it is and others might stop to wave and smile for the camera. Most camera traps are easy to use. Each camera trap will come with a manual. Configuring the camera traps are usually intuitive and easy to do. No camera trap can photograph every thing at once, you will have to decide what species you are targeting and setup the camera trap accordingly. Mount the camera trap to point parallel to the ground, not up or down. For medium to large animals try to place the camera trap at the height as the animal's shoulder. For small to medium animals try to place the camera trap just below your own knee height. For tiny animals you will have to place the camera trap as close to the ground as possible, or point the camera slightly down. Clear any vegetation from the camera's detection zone that may cause false triggers. Recently there has been an increase in the number of camera traps that can send photographs to your mobile phone or email account while still in the field. These camera traps are usually more expensive than the normal models. In order for the camera trap to be able to send the photograph it will need to be in signal range of the network tower and have a good data signal. Not all camera traps will work on all mobile networks, nor will they necessarily work in all countries. Sending the photograph will take time. The camera trap will thus only be able to send a photo once every couple of seconds (I'm guessing 15-60 seconds). The photographs that are sent are usually only thumbnails, you will still need to collect the SD card for the full size photos. These camera trap will use more power, especially if the signal is weak. A webcam usually refers to a camera that is connected to the internet and provides a real time view of its surrounding. With regard to camera trapping I think security cameras (such as closed-circuit television) can be considered a form of webcam as well. Most webcams will require a constant power supply and some form of network connection. You won't be able to use normal batteries to power them. You might also need to have a "server" where the images and video clips can be stored. Thus compared to a camera trap it is much more difficult to install and move a webcam setup. The image quality (in particular resolution) of most low to medium range webcams is usually pretty bad. Making it fairly impractical as a camera trap. The biggest difference between a webcam and a camera trap is the way in which it detects movement. The webcam will try to pick up movement by looking at the difference between subsequent photographs. From personal experience I found that this was not a very affective way to pick up animal movement and it still produces a large amount of false or missed triggers. The accuracy of the detection depends on the algorithm and computing power used. Personally I think a heat sensor or lazer trigger is still more accurate and practical. Most modern camera traps use a heat sensor, which is generally quite effective. One theoretical benefit to the way in which webcams detect movement is that it will be able to work underwater, as long as the water is clear enough. Heat sensors do not work well through water. It is also important to note that many webcams do not have a flash. Those that have one generally use a similar setup to the IR LEDs used by camera traps. To conclude, if you are thinking of buying a camera that can automatically take photographs of animals, can be placed outdoors and is easy to operate, then a camera trap is for you. If you want to chat with people online (using video) or need a CCTV security setup then the webcams are for you. Use a good image viewer on your computer. Not all image viewers are equal, some are much faster and easier to use than others. Use a GPS device to record where you've placed the camera trap. You might not be able to remember the exact location of the camera trap two months later. You do not need to buy a camera trap model with a built in viewer. You can preview the images using a normal digital camera. Simply insert the SD card from the camera trap into the digital camera. Note that not all digital cameras can view photographs from some camera trap models. If you have a smart phone then you can by a SD card adapter and preview the images on your phone or tablet. Consider recording your camera trap data in a software application such as WildLog, or a good photo management program. Remember to backup your photographs regularly.